Osmo Vänskä’s Mahler cycle with the Minnesota Orchestra is shaping up to be a coherent affair. This Second Symphony is the third release, following a Fifth Symphony in 2017 and a Sixth in 2018. Like them, this is a relatively swift reading, often elegant and lyrical, but rarely grand or monumental—though he gives the conclusion its full weight. The orchestra plays well for him, with the quality and character of the woodwind solos a real asset throughout. The surround-sound audio is good, too, although for various quirks of miking or balance, it doesn’t quite reach demonstration quality. As with the Sixth Symphony recording, this new disc stretches the limits of SACD capacity, coming in at over 84 minutes. A note in the liner says that a longer pause than usual has been left between the first and second movements, acknowledging Mahler’s desire that they should be separated by at least five minutes. This reads as if the company is showing off the sheer quantity of space that they have found on the disc, but the pause turns out to be only around 20 seconds and so hardly worth their comment. Something that could have used more explanation is the publisher credit after the title “Universal Edition/Kaplan Foundation.” This suggests that Vänskä is using the edition prepared by Gilbert Kaplan some years ago. Kaplan was then owner of the autograph score, so presumably his amendments were to bring the published version in line with what Mahler wrote. Given the scope for interpretive freedom that Mahler afforded conductors, or rather the scope for variance in spite of his often pedantic instructions, the difference between editions is probably less than the difference between performances. To my ear, the unwritten, but here emphatic, crescendo in the second phrase of the trombone choral early in the finale (Fig. 10), is different enough from what is on the page to suggest an editorial intervention. 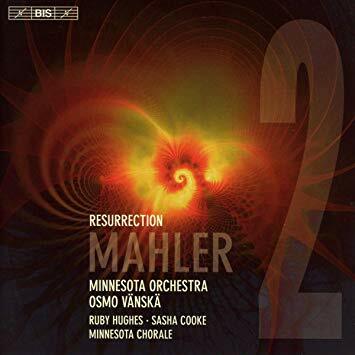 And, in fact, Vänskä generally follows the letter of Mahler’s instructions, especially with regard to extremes of tempo and dynamic, creating a distinctive character for each of the sections, and sometimes jarring contrasts between them. The opening is fast, with heavy accents and clipped phrases. But this is not typical of the movement as a whole, and in the quieter music, Vänskä focuses on elegance, the phrases always flowing and the violins always swooning right on cue. The lower end of the orchestra gets a work out in this opening movement, and the lower woodwinds always excel. The second movement melody is performed with emphatic portamento by the strings. That isn’t marked into the score either, but when Mahler does give the occasional glissando mark in the melody, Vänskä, thank goodness, doesn’t take it as an excuse for greater indulgence. At the tutti pizzicato section, Fig. 12, you suddenly become aware of the resonance of the hall, each note given a warm halo around the speaker array. The third movement is a little lacking in energy and shape, apart from a sudden surge to the climax; impressive, but the only real moment of drama. Mezzo Sasha Cooke is ideal for “Urlicht,” her voice round and warm, but not overly sensual. The last movement plays out much as the first, with a huge rush of energy in the swiftly paced opening section, before Vänskä finds a more manageable pace for the movement proper. Soprano Ruby Hughes also has an elegant tone, but much narrower than Cooke’s, and the voices don’t blend. An excellent performance from the Minnesota Chorale, though, whose ensemble, balance, and tone are ideal. There is no suggestion that this was recorded live, and indeed the uninterrupted decay after the final chord suggests that no applause followed. The surround sound audio is clear and lifelike, but not immersive. The middle channel is reserved for the woodwinds and timpani, and dominated by the latter. The second violins are seated stage left, and the separation between first and seconds is clearly delineated between the channels. Efforts have been made to acknowledge the distance Mahler calls for with the off-stage brass and percussion—some passages are marked as sounding close-by, others from the far distance—but all are too dim in the soundstage, and the distant calls can barely be heard at all. No such concerns, though, with the magnificent organ, which I assume is not in situ, but which has been skillfully integrated into the ending to give ideal weight and support. If you’ve heard the previous installments in Vänskä’s Mahler cycle, there are no surprises here. Some listeners may wish for more intensity, and perhaps more continuity to the musical drama. But Vänskä’s commitment to the detail of these scores pays off, and, as in previous installments, the result is a richly variegated musical canvas, those details as much a concern for the sound engineers as for the conductor himself.